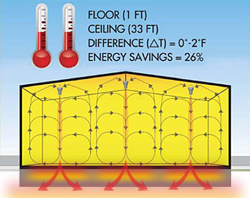 Keep workers happier and more productive by providing consistent ambient temperatures throughout your facility. Great for warehouses and facilities using 120V, 230V, or 277V electric power. Very energy efficient. 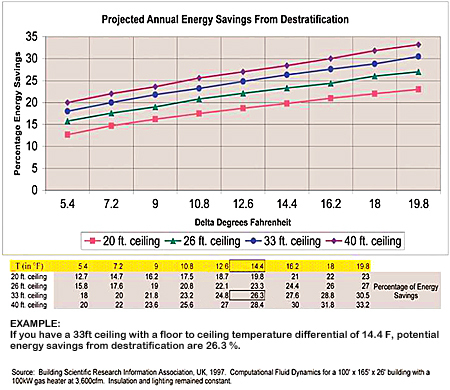 Significant energy savings even with a suspended ceiling when you include thermal equalizing fans with ceiling inserts that make them a part of the suspended ceiling. 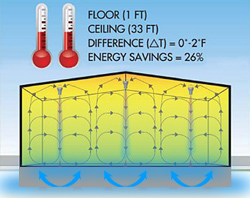 All air is drawn from room space and not from above the suspended ceiling, making work more comfortable. 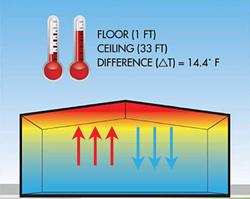 Equalize temperature zones with style using Designer Series destratifying fans to mix temperature zones in your facility. Eye pleasing shape with the same energy saving efficiency as standard thermal equalizing fans. A variety of finishes to choose from. 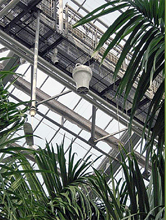 These wireless capable fans can be controlled remotely for speed, direction and cycle times when matched with a Fan Management System. May be hard wired to a traditional switch until such time as you are ready for remote controls.